This super premium, Australian made, canned dog food is complete and balanced to support the health and wellbeing of your less active or obesity prone adult dog. It contains fewer calories to aid weight management and is fortified with beneficial nutrients including antioxidants to help strengthen the immune system, zinc and linoleic acid to improve skin and coat condition, and prebiotic fibres to promote healthy bacteria in the gut for better digestive health and smaller, firmer stools. 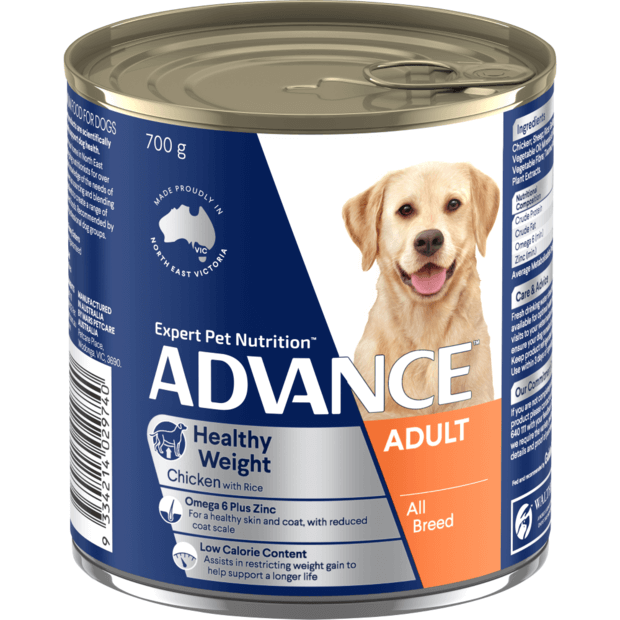 Advance Adult Weight Control All Breed Chicken & Rice contains controlled levels of minerals and is highly digestible to help reduce the risk of lower urinary tract disease. Totally recommend this food. My fussy 10yr old yorkshire terrier was a little over weight at 4.6kg. The vet recommended we get her down to 4kg. Within weeks of using this product she seems more active and has already lost .3kg! She a fussy eater but really loves this food. You won't be disappointed. 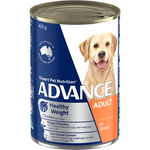 This is a great food to feed those dogs that no matter how small a meal you serve them just seem to put on weight. 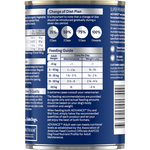 It is extremely palatable and those I have had to use it on feel full but are no longer obese. It really is a good product for those dogs. 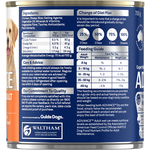 I add this to my dog's Advance Weight Control dry food. She loves it!!! !